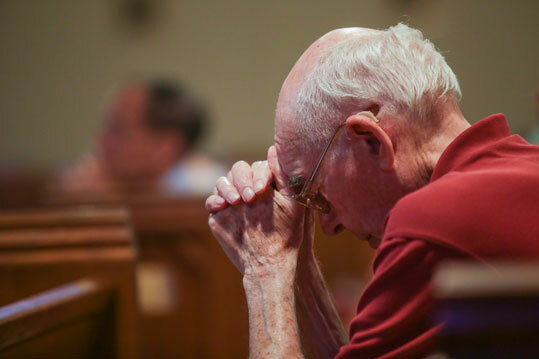 The fading light of evening streaked through the stained-glass windows at St. Richard’s Episcopal Church in Round Rock, Texas, as about a dozen military veterans knelt at the altar rail. 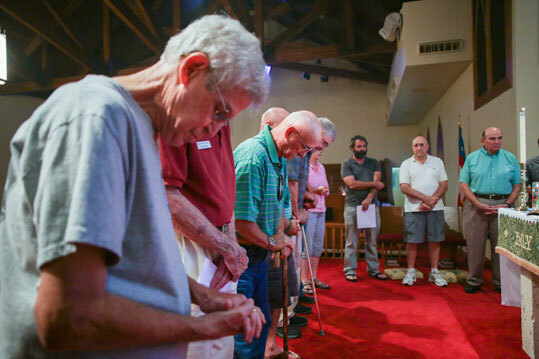 The veterans, including men who had seen combat in Vietnam, Iraq and Afghanistan, had come to the suburban Austin sanctuary that August night seeking reconciliation and healing. The priest, a slim 41-year-old former U.S. Army chaplain, invited them to write down and offer up to God any transgressions they may have committed while in the military that now plague their consciences. Silently, each person wrote a few words on a yellow Post-it, then deposited the note in a thurible used for incense. Flames darted out from the metal censer as the pungent odor of burning paper filled the church. Slowly, the sticky notes turned into ash. 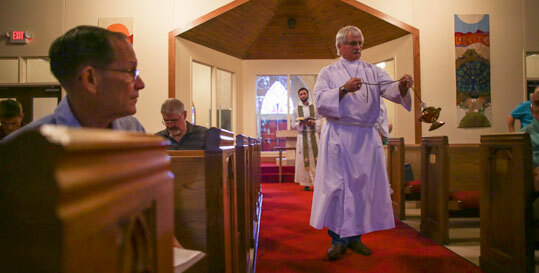 Warren Gillespie swings a thurible as the smell of burning paper fills the sanctuary at St. Richard's Episcopal Church. The ceremony -- a “moral injury healing service” -- is one of several ministries conducted by the Episcopal Veterans Fellowship. Founded by Peters in 2014 in Austin, the organization is a network of veterans and family members who meet twice a month to pray together and share the spiritual angst that lingers from military service. 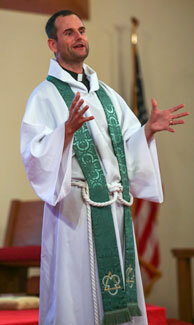 The fellowship is active in several parishes in the Episcopal Diocese of Texas, including St. Mark’s Episcopal in Austin, where Peters serves as associate rector. 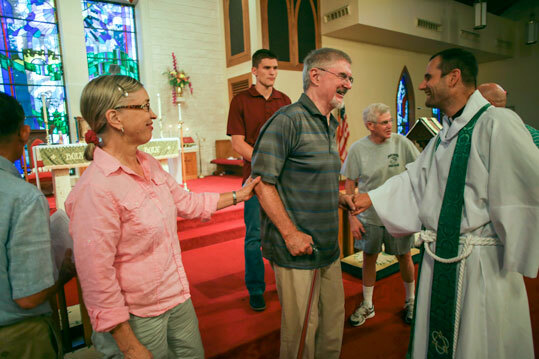 In an effort to heal from moral injury and build a community for struggling veterans, members participate in reconciliation services, retreats and pilgrimages. They also teach other churches about their peer-led model, the first of its kind in the Episcopal Church. And with the support of the Episcopal Church Foundation, Peters travels to parishes around the country to help them create their own veterans ministries. Peters knows firsthand how important such ministry can be. Like many of the men and women he ministers to in the fellowship, Peters -- who served a year in Iraq -- has grappled with guilt, loss of faith and the lure of suicide. After his deployment to Baghdad from 2005 to 2006, Peters plunged into a dark spiral. He went through a crushing divorce that cost him his ordination in the Bible Fellowship Church. Eventually, he made his way to the Episcopal Church, where he was ordained in 2012, and discovered a major source of his pain: moral injury, a penetrating soul wound soldiers incur when they violate their consciences on the battlefield. The ancient practices of penance and pilgrimage helped Peters to heal and inspired him to build a ministry to help other vets. From his years as an Army chaplain and his earlier experience as an enlisted Marine, Peters knew when he formed the Episcopal Veterans Fellowship that veterans would do best in a community of fellow veterans. He also knew from his theological training that veterans needed the sacramental structure of penance and reconciliation -- even if their faith was destroyed. For many soldiers who’ve been through combat, the moral universe has shifted, Peters said. How can your church create and witness to morality for people who doubt God’s goodness or even existence? Part of a much broader movement in the church to minister to veterans, the fellowship is increasingly focused on what experts call “moral injury.” In the last few years, books, articles and conferences have explored the topic, and philanthropic foundations have awarded large grants to faith-based moral injury projects. Unlike post-traumatic stress disorder -- which is rooted in fear and marked by flashbacks and hypervigilance -- moral injury refers to the turmoil people experience when they violate their core values, such as a prohibition against killing. In combat, morality can become distorted, and when soldiers return to civilian life, they often feel spiritually unmoored, disconnected, even suicidal. Veterans and family members prepare to receive communion during the healing service. With all the attention focused on PTSD in recent decades, mental health professionals missed the moral devastation that many soldiers endured, said the Rt. Rev. James Magness, a Vietnam War veteran, former U.S. Navy chaplain, and until recently bishop suffragan for the Episcopal Church’s Armed Forces and Federal Ministries. “There’s another component of being in combat and experiencing combat that has little if anything to do with post-traumatic stress and has to do with … moral wounds, or moral injury,” said Magness, who has been a mentor to Peters. The concept of moral injury -- a term often credited to psychiatrist Jonathan Shay -- is as old as war itself, scholars say. But it went unaddressed for centuries and is now gaining traction in both clinical and religious circles. The departments of Defense and Veterans Affairs now acknowledge moral injury as a condition distinct from PTSD, though many people still conflate the two. In his 2016 book, “Post-Traumatic God: How the Church Cares for People Who Have Been to Hell and Back,” Peters writes that war thrusts soldiers into an “upside-down moral universe” where “everyday cruelties abound” and in which everyone -- even the chaplain -- absorbs guilt. John Miller, a former midshipman in the Navy, bows his head in prayer. Some soldiers incur moral injury because they have tortured a prisoner or killed a civilian. After returning from Iraq, Peters heard dozens of horrific stories when he counseled injured soldiers at Walter Reed Army Medical Center. For others, it’s less dramatic. Peters cites a relatively minor episode that haunted him for years. While riding atop a Humvee, he witnessed an Iraqi soldier punch an elderly man in the stomach. Peters did nothing. His unit rolled on. “That’s the ‘thing left undone’ in a confession,” he said. What are the “things undone” for your church or organization? Peters, who is now remarried, found strength and a return to wholeness in centuries-old sacraments and penitential rites. As he discovered, religious rituals can sometimes provide more meaningful recovery than traditional psychotherapy. The Rev. 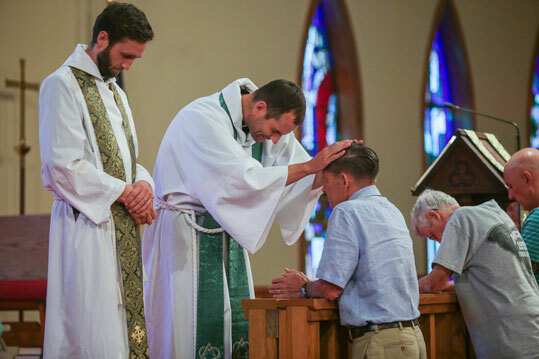 Zac Koons, left, associate rector at St. Richard's, bows his head as Peters blesses Scott Beachy. Because study of moral injury is still in its infancy, no research has been conducted comparing clinical treatment with spiritual approaches, said Dr. Warren Kinghorn, associate research professor of psychiatry and pastoral and moral theology at Duke Divinity School. But religious approaches can provide a depth and context that no secular approach can, he said. Does your church address or avoid complex moral issues? That has been the Rev. Rita Nakashima Brock’s focus for the last several years. In 2012, she started the Soul Repair Center, the first moral injury program in the country, at Brite Divinity School in Fort Worth. The center provides resources and training for congregations. While Brock promotes a spiritual response to moral injury, she’s quick to point out the church’s complicated history with war. Early Christians regarded military engagement as sinful. As the church developed, however, theologians such as Augustine of Hippo refashioned Greco-Roman just war theory for a Christian audience. Later, during the Crusades, the church treated war as a holy act in which soldiers could receive absolution for their sins. She and Peters agree that today’s nationalistic fervor leaves little space for soldiers to talk openly about moral injury. “When we lost the penitential system, we lost the ability to do both -- to be a good Christian and to serve in the military,” Peters said. Peters looks to the pre-Crusades Ermenfrid Penitential for inspiration. After the Battle of Hastings in 1066, Bishop Ermenfrid of Sion and other bishops prescribed various acts of atonement for the invading Norman soldiers -- a year of penance for every person they killed in battle, for example. If today’s veterans believe they have sinned, Peters said, the church does them no favor by saying, “Oh, don’t feel bad; you were serving your country.” Instead, the church should help people repent and move toward reconciliation. Who is your church helping to repent and move toward reconciliation? In the past, he said, monks offered spiritual guidance to returning warriors. Hoping to play a similar role and to deepen their commitment to ministry, some members of the Episcopal Veterans Fellowship have formed a monastic order, the Hospitallers of St. Martin. Hospitallers pray the daily office, fast weekly and seek out veterans -- as well as others affected by war, poverty and violence -- who need help. For Peters, who grew up in a fundamentalist church in Pennsylvania, the Episcopal Church’s sacraments and disciplines provide a road map for healing, one that resonates with others. Peters welcomes veterans to the moral injury healing service. But it’s not easy convincing veterans to show up, especially those who served in recent wars. Robert Hoehn, a Vietnam War veteran and member of the fellowship’s Round Rock chapter, understands. It took him decades to confront his moral injuries. In the late 1970s, a Veterans Affairs psychologist counseled Hoehn to picture himself putting his feelings in a box and placing it on a shelf. It worked. He focused on his career and raising his two sons and kept his guilt and grief at bay. In 2008, Hoehn was diagnosed with Parkinson’s and had to retire. Some of his symptoms were unmistakably PTSD. But he was also consumed with guilt. Two years ago, a friend convinced him to attend an Episcopal Veterans Fellowship reconciliation service. Eventually, Hoehn and his friend Warren Gillespie started a fellowship chapter at their own parish, St. Richard’s. Their twice-monthly support group usually draws 15 to 18 people. Both took Hospitaller vows. “I’m so much healthier than I was,” Hoehn said. He credits God. And Peters. What makes the Texas fellowship work is Peters’ credibility as a fellow veteran, said Magness, now bishop assisting for the Episcopal Diocese of Southern Virginia. “One thing that nonveterans can’t do is establish a safe environment [for veterans],” he said. What role can non-veterans play in helping veterans heal? Magness attended the fellowship’s first retreat with more than 20 veterans at a Catholic monastery in Central Texas. That peer-led model is central to other efforts around the country. Earlier this year, Brock left Brite for the nonprofit organization Volunteers of America, where she is working on a two-year pilot program called Spiritual Resiliency Training. Funded by a $918,000 grant from the Bristol-Myers Squibb Foundation, the peer-led interfaith project will use meditation and other spiritual practices to help veterans develop inner awareness, acclimate to civilian society and sleep better. Brock, the daughter of a World War II and Vietnam veteran, believes that people who have been in the military find the structure and repetition of religious ritual comfortingly familiar. Meanwhile, the Soul Repair Center continues working to equip congregations to help veterans with moral injury, said the Rev. Nancy Ramsay, the chair of the center’s national advisory board. Ramsay wants to see congregations address the moral injury not only of veterans but of all Americans. Peters is working to spread that message beyond his diocese. He has already helped start a chapter in South Carolina. In June, he received an Episcopal Church Foundation fellowship, which will enable him to travel to Episcopal churches around the country and help leaders improve their veterans ministries or start new ones. After the moral injury service, Pauline Hoehn and her husband, Robert Hoehn, greet Peters. 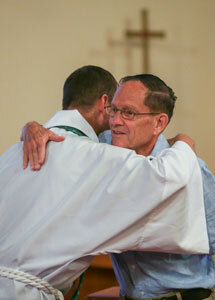 After the recent reconciliation service at St. Richard’s, veterans mingled in the sanctuary. Hoehn, the group’s jokester, teased his friends, including newcomer Brad Hardin, a Navy veteran who served from 1977 to 1984 and later worked for the National Security Administration. Hardin admitted he wasn’t big on groups but was relieved to release some of his burdens. “A lot of things I did I’m not proud of,” he said. Hoehn nodded emphatically. “I think I’m hiding something no one else will know,” he said. That’s one of the gifts of the fellowship, Hoehn said -- discovering he isn’t alone. The fellowship’s task is to be a visible presence, to be there whenever veterans are ready to show up. His military training has taught him to keep flying the flag. What does it mean to “witness to morality?” How can your church create and witness to morality for people who doubt God’s goodness or even existence? Violating one’s core values is not unique to those in combat. In what ways can core values be violated in civilian life? To what extent does your church address complex moral issues? To what extent does it avoid them? Do you agree that only veterans can create a safe space for other veterans? What role can non-veterans play in helping veterans heal?